I was hiking along the shores of Two Rivers Lake in Rocky Mountain National Park looking for compositions to photograph Notchtop Mountain reflecting in the lake. 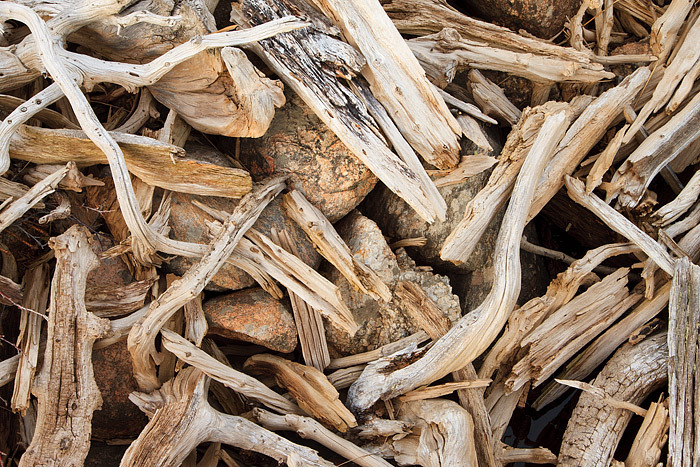 As I walked past the outlet of Two Rivers lake, this pile of sticks and logs immediately caught my eye. Almost the entire outlet of Two Rivers lake was covered with these beautiful pieces of wood. Sun, snow and wind helped to sculp these pieces of wood and water had moved them into these interesting patterns. Photo © copyright by Thomas Mangan.